Christmas lights, homemade ornaments, and family members joined together singing Christmas songs. What sounds like a perfect holiday card also describes the 2015 Apple Holiday Christmas ad. 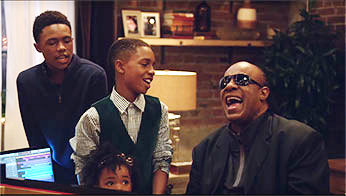 The ad opens with Stevie Wonder and blues singer Andra Day performing Stevie Wonder’s 1967, “Someday at Christmas.” In the beginning of the commercial, Stevie Wonder is seen utilizing the Voiceover Accessibility feature on a MacBook laptop. As the song continues, the scene of a festive, holiday living room with people decorating the Christmas tree plays out in the background. As the scene plays out there is a quick glimpse of an Apple Watch. Throughout this commercial the references made to Apple products are surprisingly few. The few glimpses, however, are exceptionally clever and well placed. By taking this approach Apple sends an even more powerful message. Referencing both the Voiceover and the Apple watch without making them the main focus of the commercial showcases the confidence Apple has for their brand and products. Additionally, by shifting the focus of the product Apple has put the emphasis on what we should all be thinking of this holiday season—spending time with family and loved ones. While spending time with family and loved ones over the holidays, many of us have special traditions we take part in. In the commercial, the family came together decorating the Christmas tree and singing Christmas songs. Although somewhat less traditional, every year my family bakes a mass amount of Christmas sweets and then watches multiple Christmas movies. Whether singing Christmas tunes together or throwing baking flour across the kitchen, this year let us all take Apple’s lead and focus this season on our family and loved ones.